After witnessing terrible tragedy in his youth, Tommy turns pain into triumph when he becomes an international pinball superstar. Exhilarating and emotional, The Who’s Tommy uses classic rock-n-roll music to create an intense, one-of-a-kind experience that, in the end, is truly about self-acceptance and forgiveness. Rick McAuliffe has seen good times — and a lot of bad times — in his Classen-10-Penn neighborhood since he first bought his home 27 years ago. For a while, McAuliffe said, Classen-10-Penn had the city’s highest crime rate. Poverty is no stranger to the area either. And yet, McAuliffe insists, the community remains intact. Hope pervades, and McAuliffe is hoping his neighborhood will be chosen for a new federal program that will provide the city with $8.6 million to buy vacant foreclosed houses, rehabilitate them, and then turn them over to families who will make them their homes. Planning Director Russell Claus, who is overseeing the program, is looking at a rapid schedule dictated by theDepartment of Housing and Urban Development; the city had just a couple weeks to prepare an application before the Dec. 1 deadline, and then received approval earlier this month. The money will be allocated on Feb. 13. Many questions remain. The program requires the city to use the money in neighborhoods hardest hit by foreclosures and subprime lending.The city must also identify qualifying homes and then negotiate purchases from mortgage holders at 15 percent below appraised value. Claus’ department has identified an 8-mile stretch in the inner-city that includes Classen-10-Penn, Linnwood, Oak Cliff and Crestwood neighborhoods. The next step, Claus said, is to figure out where the city can make the greatest impact and whether banks will negotiate. Estimates show foreclosures in Oklahoma City were up 35 percent over the past three years, though the most recent reports show the increase even higher. The goal, Claus said, is to rescue neighborhoods that still are communities — and to trim the current foreclosed property market by 20 percent. Claus applauded Congress for passing the legislation last summer as a way to directly combat the aftermath of disastrous sub-prime loans that left many homeowners with mortgages they couldn’t afford. Rasco said she hopes the foreclosure program might reduce the number of homes owned by out-of-state owners who never even see their investments. Rasco said the Classen-10-Penn neighborhood is a great target. McAuliffe hopes more families will follow with the help of the city’s investment — and looks forward to seeing more wedding ceremonies and block suppers in the future. Such sense of community is what the city is looking for. Claus just hopes the investment will be enough to avoid the damage done when the city and state were plunged into an economic depression in the 1980s. This photograph is available for a purchase price of $30,000. Now that the masses of confetti, glitter and whistles are cleaned off the streets of Oklahoma City, on January 9th the Plaza District will still be celebrating a new year with new artists, musicians, CD Releases, grand openings and more with LIVE on the Plaza! 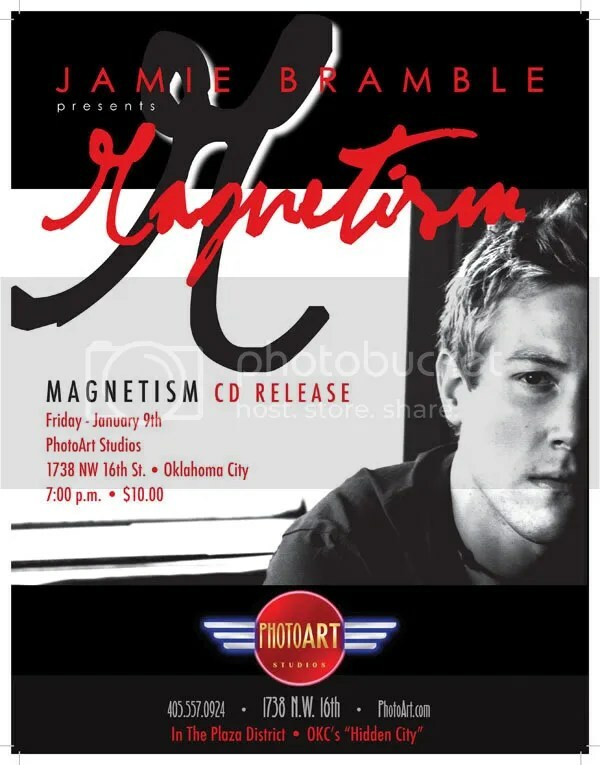 Musician Jamie Bramble releases his new album “MAGNETISM” at PhotoArt Studios. Although Jamie is only twenty-two, his compositions, arrangements, and lyrics reveal talent and wisdom beyond his years. With his first studio effort, “Complete Lack Of Oxygen”, Jamie has found a unique blend of haunting, yet inspiring melodies with bittersweet lyrics that touch the soul and appeal to a broad range of musical palates. Check out his newest release! tickets available at the door! DNA Galleries features new artwork, t shirts and prints by Jerrod Smith, while Bad Grannies Bazaar hosts a grand opening for their new location and new vendors during their open house at 1759 NW 16th St. Don’t fear the cold, for Paula & Co. Realtors have prepared a delicious chili cook to warm up all who visit LIVE on the Plaza! Other participating businesses will be open for shopping as well. Also, the following Saturday night don’t miss the official release of the new album “HEY THERE”, at one of the coolest venues in OKC, Lyric at the Plaza. Come hear Kelsey’s new tunes with a live band, a gospel choir, horns, strings, back up dancers, the works! (and a surprise at the end!) Don’t miss it! Tickets available online at kelseyhumphreys.com/store, or cash at the door.